In a clinical trial, when a subject has a serious adverse event (SAE) or other significant adverse event (AE), such as those leading to the discontinuation of the study, a narrative is written for the clinical study report. These narratives summarize the details surrounding the event to enable understanding of the circumstances that may have led to the occurrence of the AE and its subsequent management. Such details may include the dose of the study drug taken at the time of the event, the duration of the dose prior to the event, concomitant medications taken at the time of the event and those used to treat it, and other adverse events that may have recently occurred. 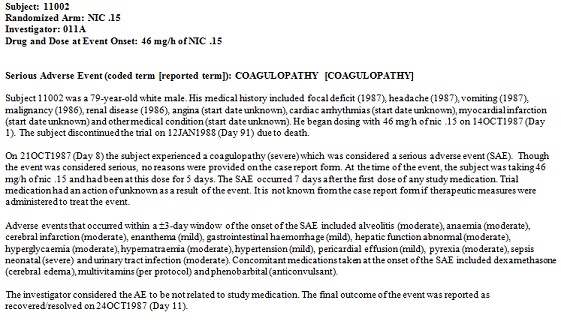 Other details include demography and medical history, the severity of the event and whether the AE was related to study medication. Information contained in the typical narrative requires the review of many data sources. This is often time consuming, and true for any manual effort, can require additional review and quality control. In contrast, the narrative in Figure 1 was written by JMP Clinical directly from the SDTM data sets. Various options permit the user to tailor the narrative to their needs and, once generated, allow for further nuancing. Allowing a program to generate narratives initially can give the writer an idea of common themes, and for therapeutic areas where multiple SAEs per subject are the norm, can hasten the writing process. For the Nicardipine test data that is included with JMP Clinical, 683 SAE narratives were generated in less than one minute.